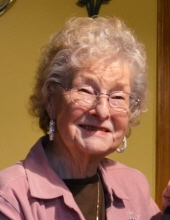 Lorraine Ellen (Ehlo) Foellmi, age 89, of Sparta, passed away on Saturday January 26, 2019 at the Morrow Home in Sparta, surrounded by her family. Lorraine was born on December 11, 1929 in Bangor, Wisconsin to Albert & Hannah (Pedersen) Ehlo. She graduated high school in West Salem and married Norman J. Foellmi on February 4, 1950. Lorraine loved dancing. She & Norm were on the floor whenever a polka or waltz was playing. They spent many summers boating in West Salem and on the Mississippi River. They shared their love of boating & dancing with their five children, and with many friends & family who joined them. They ran a dairy farm North of Sparta for many years, and continued to live on the farm land to the present. Lorraine is survived by her husband of nearly 69 years, sons Steven (Jean) Foellmi of Lake Forest, CA, Randy (Beth) Foellmi of Green Bay, Paul (Linda) Foellmi of Faribault, MN, Jerry (Mary) Foellmi of Portage and daughter Cindy (Jim) Elsen of Sparta. She is also survived by 10 grandchildren, 15 great-grandchildren, and sister Donna (Harry) Meinking of LaCrosse. She was preceded in death by her parents and grandson Tyler Elsen. Lorraine was an active member of Mineral Springs Rebekah Lodge #41 and the Sparta Eagles Club Auxiliary. In 2013 she was inducted into the Eagles Club Wisconsin Hall of Fame. She was a regular volunteer for Town of Sparta voting & polls, local Red Cross blood drives and numerous other volunteer efforts. Family and friends are invited for visitation on Wednesday, January 30, 2019 at the Trinity Lutheran Church on N. Water Street in Sparta from 1:00 until 4:00 pm with a Memorial Service to follow. In lieu of flowers please send donations to Morrow Home, Mayo Hospice Music Therapy program, or the Sparta Eagles Aerie. The Torkelson Page-Smith Funeral Home of Sparta is assisting the family with arrangements. Online condolences are available at www.torkelsonfuneralhome.com. "Email Address" would like to share the life celebration of Lorraine Ellen Foellmi. Click on the "link" to go to share a favorite memory or leave a condolence message for the family.